At only 43 years old, Nanay Josephine Mayuga has already gone through the most painful experience for any parent. It was the first day of September in the year 2000 when her first born child – a three year old girl – was hit by a motorcycle in their native province of Batangas. Her child did not survive the impact. After their child’s burial, Nanay Josephine and her husband Tatay Ronaldo went up to Baguio to seek healing from the tragedy. While Nanay Josephine stayed at home, Tatay Ronaldo tried to move on from the trauma by engaging in a buy and sell business. He went from door to door, selling kitchen appliances that were popular at that time, such as Master Oven Toasters, pressure cookers and other kitchen supplies. It only took a few weeks of door-to-door selling before Tatay Ronaldo decided to quit. Their buy and sell business required a large amount of capital to purchase their inventory, but their customers were unable to pay for their ordered items in full, taking them weeks to completely settle their payments. Nanay Josephine Mayuga has been in the slippers manufacturing business for almost two decades. When October rolled around, the couple moved to Caloocan, where they are still residing today. Her husband’s in-laws observed they still haven’t moved on from the tragedy of their child’s untimely passing, and encouraged them to start their own business. It didn’t take long for the resilient couple to decide on what kind of business to pursue this time. “Kaya po gawaan ng tsinelas yung nagustuhan namin kasi yun po ang hanap-buhay ng aming mga magulang,” Nanay Josephine shared. Months before tragedy struck, Tatay Ronaldo was already buying and selling slippers in wholesale quantities, together with his parents. 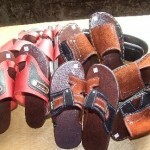 The Mayuga couple manufactures slippers for male and female adults. 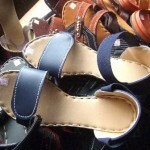 Seventeen years later, the Mayuga’s slipper manufacturing business is not only alive but thriving. This is a feat for a small business in a volatile environment where SMEs are notorious for suffering high mortality rates. Nanay Josephine proudly shared that through the revenues generated by their business, they were able to purchase an owner type jeep and send their two sons to the Salvador Araneta Memorial Institute, a private school located in the nearby city of Malabon. From the very start of their slipper manufacturing business, Nanay Josephine felt positive and hopeful about their success. “Marami kaming tindera noong panahon na yun. Hindi kami nawawalan ng taga-takbo ng tsinelas,” she says. They focused on the adult market for their slippers, creating comfortable and well-designed slippers for grown-up males and females. When asked where they get design ideas for their slippers, Nanay Josephine responded, “Sa brochure ng Natasha at internet. Pag nagpupunta kami sa mall at may nakitang magandang design, bibilhin namin iyon at tutularan.” This resourcefulness has contributed to their profitable sales, which is influenced by their beautiful designs. “Kapag maganda ang design, kahit abutin ng taon, hinahanap pa rin ng tao. Hindi katulad nung iba na three months lang, mahina na tumakbo ang benta.” Their focus on their design quality led them to narrow their designs from 13 to 9. 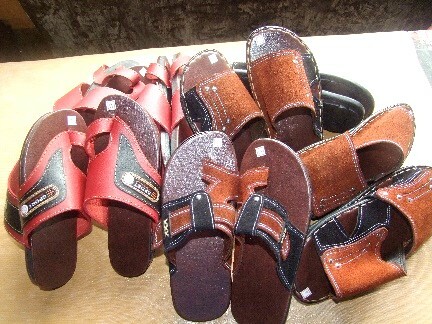 The beautiful designs and quality workmanship of their slippers contribute to their business’ success. Their initial investment for their equipment alone exceeded ten thousand pesos (Php 10,000), an amount they were able to get back after only two months. “Bumili kami ng hulmahan ng tsinelas, gunting, pang-slice ng goma at molihon, yung pangkinis ng goma sa gilid ng tsinelas. Bawing-bawi agad pagkatapos ng dalawang buwan,” Nanay Josephine said, beaming with pride. Her vision of success seventeen years ago is not far from their reality today. The third floor of the Mayuga home has been converted to their production area. In this photo, Nanay Josephine watches one of her workers assemble a sllpper. 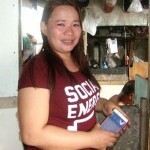 At the time of her interview, their family business provides employment to eight skilled workers, as well as regular income to sixteen sellers, nine in Caloocan and seven in Abra. “May isa kaming taga-gawa ng dahon o entrada, tapos may ino-orderan din kami ng yari ng entrada sa Bulacan. May dalawang tao kami na taga-lapat para mabuo yung tsinelas at limang mananahi. May siyam kaming taga-deliver ng tsinelas dito sa Kalookan.” Three of their nine sellers around Caloocan are Nanay Josephine’s brothers. All their slippers are made in the topmost floor of the three-story building they are renting in Caloocan. The bottom and middle floors serve as their family’s home. But as with other entrepreneurs, their road towards success had its share of bumps and setbacks. Sometime in 2013, one of their sellers informed them that a wholesale buyer from Canada arrived in town. Wanting to seize a once-in-a-lifetime opportunity of having a foreign market, they rushed to manufacture two dozens of slippers. After entrusting the slippers to the peddler, they never saw him again. Nanay Josephine’s positivity in the face of that challenge is an inspiration for other entrepreneurs as well. “Hindi na namin masyadong inisip. May mas malaki pang biyayang dumating na kapalit nun,” she shares matter-of-factly. Interestingly, this experience did not make them change the way they engage with their sellers. The Mayuga couple has a positive reputation in their community on how they treat their workers and sellers. Maybe for some business experts, this is a very risky strategy, but showing this high level of trust to their sellers is what makes their business different and grow, according to Nanay Josephine. Their sellers have been vocal about how much they appreciate the trust the couple gives them. “Sabi ng aming mga tauhan, kami lang daw ang marunong makisama. Sabi nila, ‘Buti pa dito, hindi nagpapabilang sa hapon, hindi katulad ng iba, bibilangin talaga kung ilan na lang ang natirang tsinelas sa bag.’ Hindi kami masyadong strikto.” Their reputation as kind employers continues to serve them well to this day. Tatay Ronaldo is Nanay Josephine’s husband and business partner who manages the distribution of their slippers all over Luzon. 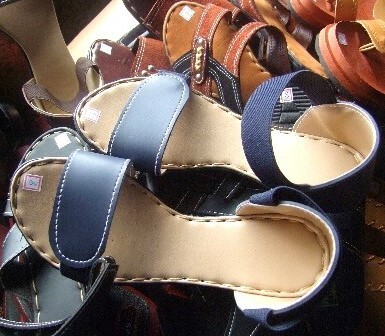 Nanay Josephine considers her family as the reason why she persists in their slipper manufacturing business. She counts her husband, Tatay Ronaldo, as her reliable partner not only in life but in their business. 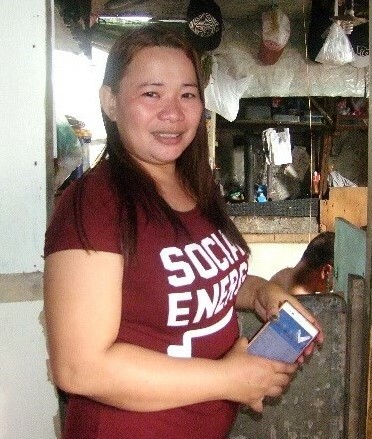 While she stays in Caloocan to receive the remittance from their sellers and record it, Tatay Ronaldo travels around Luzon for the delivery and distribution of their slippers. 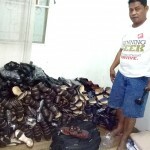 At the time of her interview, Tatay Ronaldo was delivering their slippers around Abra, where they have an additional seven sellers. While she considers the possibility of passing on their business to her two sons, she values their education above all. “Priority ko pa rin po na mapagtapos sila ng pag-aaral at makakuha ng gusto nilang kurso,” she adds. Her elder son, now a Grade 10 student, dreams of being a policeman, while her younger son wants to take up Civil Engineering. She envisions a larger business ten years down the line, where they are producing slippers for delivery to just about any country. 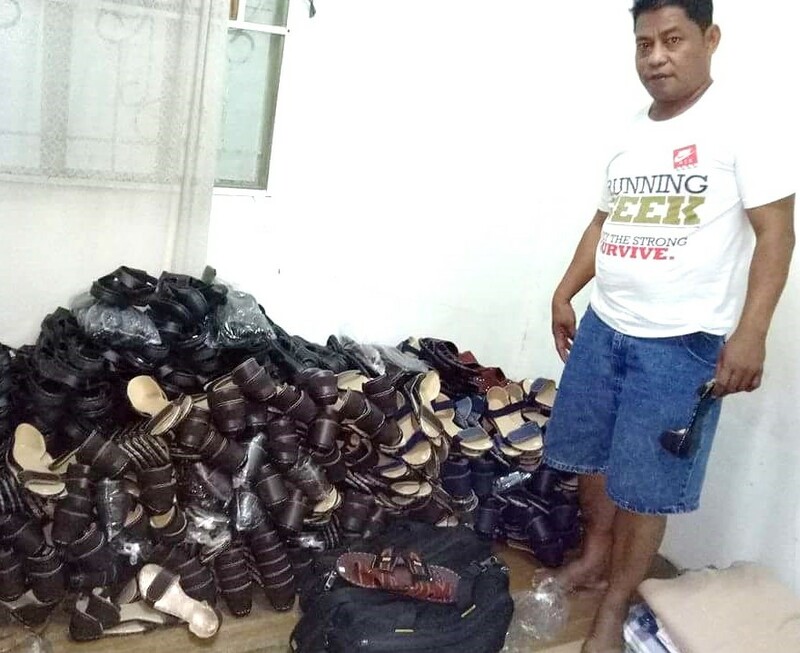 At present, the farthest places their slippers have reached include far-flung provinces such as Aurora, Bataan, Daet, Laoag, Legazpi, Sorsogon, Pangasinan and Zambales.“Magpupursisigi pa po ako para mapaganda ang aming pagawaan ng tsinelas, hanap pa ng magagandang yari at design para malayo ang aming marating,” says a very committed and hopeful Nanay Josephine. With every pair of slippers they manufacture and sell, Tatay Ronaldo and Nanay Josephine confidently strides towards their complete healing and greater success.